When Gabrielle Scrimshaw held her nephew Ethan for the first time, hours after his birth in 2006, she was touched by an overwhelming feeling of love but also by a sudden resolve. Growing up a Dene in north central Canada, one of the 600 aboriginal groups of Canada’s First Nations, Scrimshaw, a graduate from the University of Saskatchewan’s Edwards School of Business, knew firsthand the challenges that mark the lives of Indigenous peoples. Over the past decade, Scrimshaw has been doing that and more. A Gleitsman Fellow at the Harvard Kennedy School of Government, Scrimshaw is completing a Master in Public Administration. Last year, she earned an M.B.A. from the Stanford Graduate School of Business. Scrimshaw grew up in a town of 800 people in Saskatchewan, home to the Hatchet Lake First Nation, of which Dene people are part. When her nephew was born, she had just been accepted to the U of S, becoming the first in her family to go to college. To celebrate, her father took her to the only diner in town, where she “had the best BLT sandwich” ever, she said. She and her two sisters were raised by her father. And so Scrimshaw started down an unfamiliar path for Indigenous peoples in Canada, home to more than 1.5 million aboriginal people, divided among First Nations people, Métis, and Inuit. Together they represent 5 percent of Canada’s population, but a much greater percentage of the country’s poor and unemployed. From the moment Scrimshaw went to college, she was determined to forge her own trajectory. 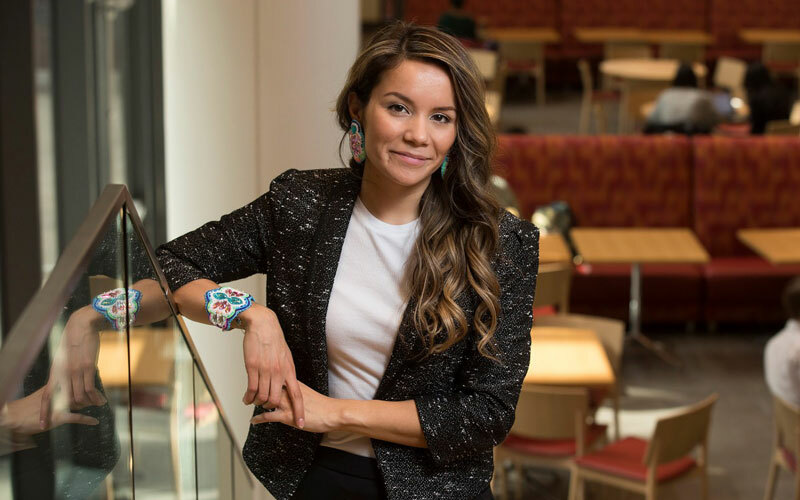 She graduated with a bachelor’s in marketing and traveled to 18 countries in four years, meeting indigenous peoples around the world and discovering their common history of colonization, discrimination, and forced assimilation. She still feels outrage at the injustices committed against native peoples all over the world, but she prefers to focus on being inspired by their shared strength and resilience. This article was originally published in The Harvard Gazette.